We had just left Kiyomizu-dera and headed down to Gion via the Yasaka Shrine . You can't visit Gion without first visiting this shrine. 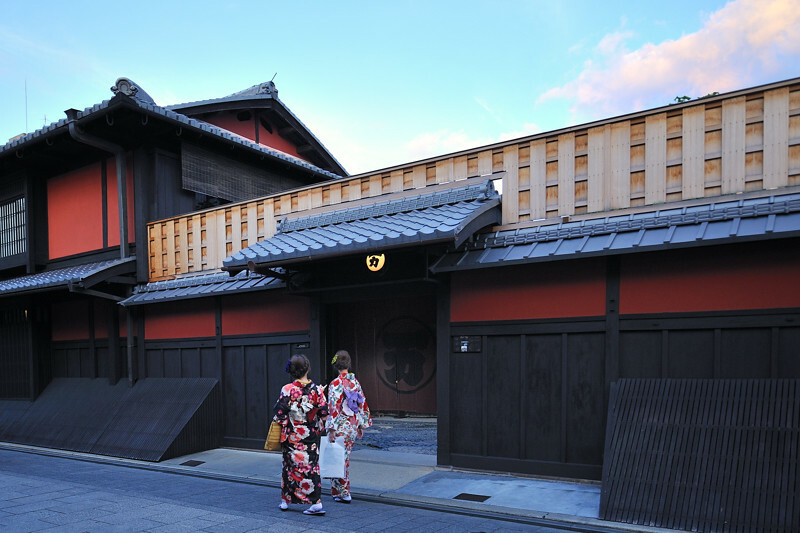 Yasaka is the spiritual centre of Gion and the reason everything around it even exists. In the middle ages, hundreds and thousands of people came through this area to make a pilgrimage to the shrine. The neighbourhood was built up around it to feed and house all the travellers passing through. A shrine has stood on this site since 656, but Yasaka was founded in 1350. 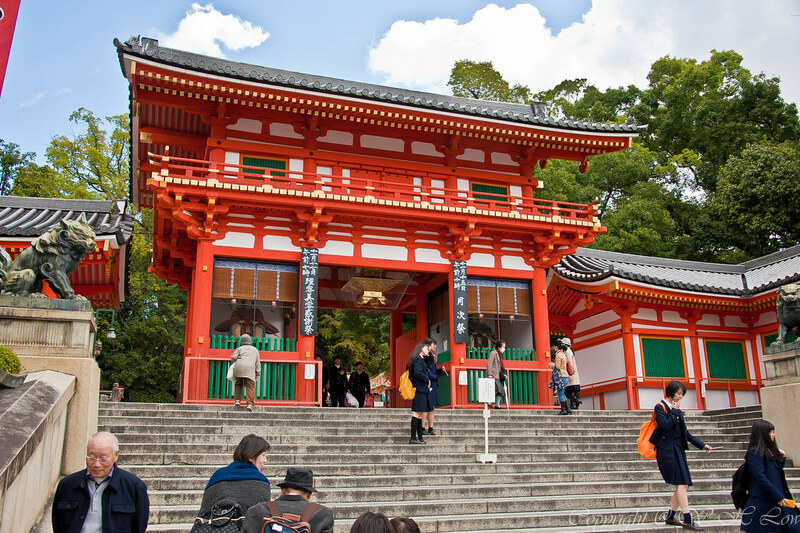 The shrine was built to honour Susanoo-no-mikoto , a great Japanese god who defeated an eight-headed serpent and helped prevent many disasters. During the evening or at dusk is when this temple comes alive. The hundreds of lanterns which hang outside, each one donated from a local business with their name inscribed upon it, all light up when the sun goes down. It is a remarkable site to see against the backdrop of the bright, vermillion painted gates and edifices of the shrine. After touring the temple, we headed down Shijo Dori toward our tour groups meeting point. Shijo street is the best place to do some shopping while in Gion. Here you can find traditional sweet shops, pickles and handicrafts. This is the most modern area of Gion and any of the streets which branch off from Shinjo will take you right back in time. There are a few famous sweet shops along this stretch worth stopping inside, but overall it's a nice strip to browse or grab a coffee, as we did, sit by a window and see if you can spot a Geisha on her way to work. This is how we spotted our first Maiko (a Geisha/Geiko in training). Many people go out looking for Maikos on their way to work but finding a place where their schools let out is the way to catch them while they're not in too much of a rush. Geikos and Maikos are the words for Geishas and Geishas-in-training in Kyoto. Geiko literally translates into "a woman of art". 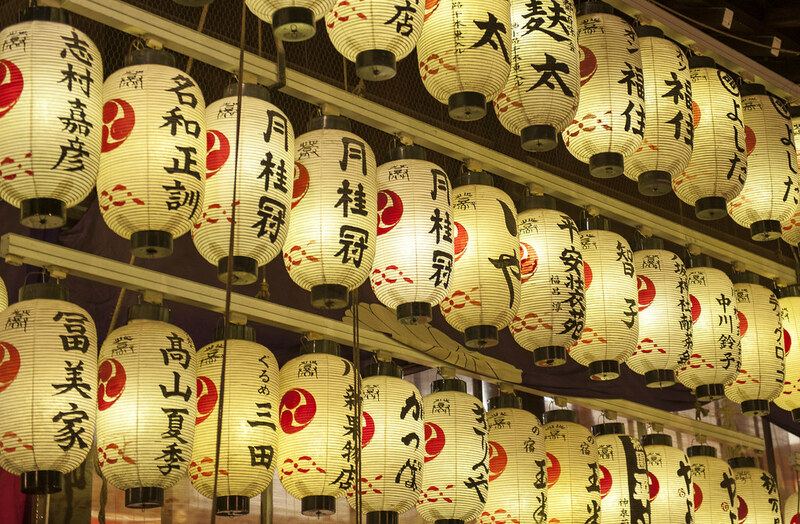 Geikos are trained in all the different art forms of traditional Japanese art. They will be proficient in playing music, to paintings, flower arranging, singing and dancing. If you see a Maiko or Geiko in the streets, be respectful. They don't mind if you take a picture, but they won't stop and take a picture with you or stop and chat. Let them go on their way and just allow yourself to be an observer in the whole experience. You can tell the difference between a Maiko and a Geiko by their dress. Maikos will have decorations like flowers in their hair, while a Geiko will not. Also, Maikos obis (the belt they wear around their kimono) will stretch almost to the ground while the Geikos obi is neatly folded around her back. The last way to tell the difference is the shoes. Geikos have flat shoes called "zori" while the Maiko wears the iconic high platforms "okobo" slippers. The reason the Geikos have a much more subdued appearance than their trainee counterparts, if because these women have already made it and don't need to show off. As night sets on the city, it was time to meet our group. Our night guided tour of Gion was lead by Waraido Guides . The night tour was nowhere near as good as the backstreets tour we had taken in the afternoon. Our group was MASSIVE! It took away any of the intimacy we had on the previous tour, and it was hard to ask questions and make the tour more personal. Our guide was very knowledgeable and patient with answering the few questions she could, but overall it was a little chaotic at times to move around with such a large group. Kyoto is known for being the birthplace of Geishas in Japan. Kyoto was the Imperial capital of Japan from 794-1869, and as a powerful capital, it required the best of all entertainment for their dignitaries and foreign guests. Unlike many movie portrayals or common myths, Geisha's or Geikos are not escorts or prostitutes. They are profession entertainers. But there is so much more to Gion than just the Geishas. The cobblestone streets next to the Kamo River , we find the tiny Temple of Chugen-ji . Inside this temple, you'll find Jizo, a Buddist guardian saint. But this Jizo enshrined here is extra special. 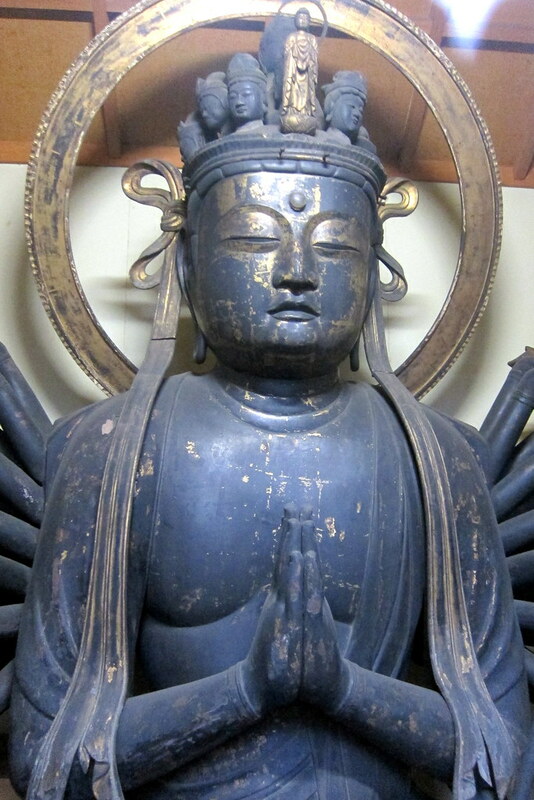 During the great floods of 1228, the people of Gion prayed to Jizo to save their town from the rising waters. People claimed they saw Jizo physically saving people from the flood and saw him stop the rain. This temple is dedicated to the saving of the town, perhaps without his intervention, it wouldn't be standing here today. Near the temple, we can see the Minamiza Kabuki Theater . 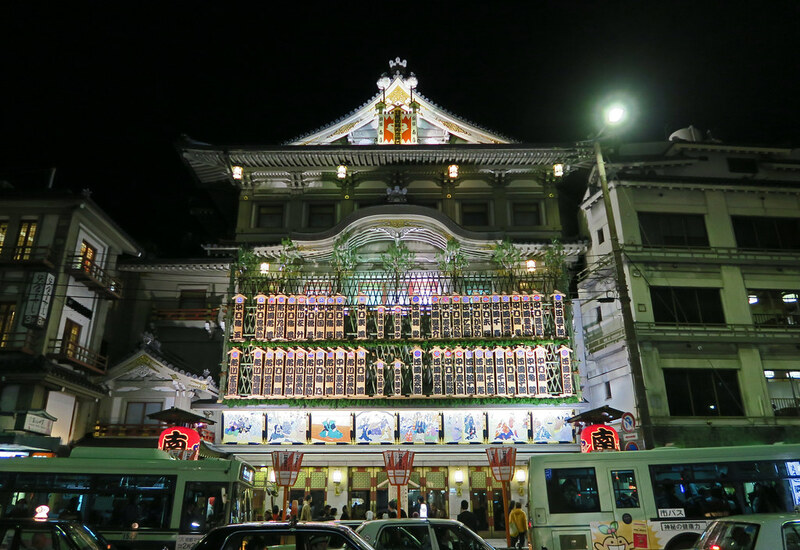 Minami-za is the best kabuki theatre in Kyoto. It was founded in 1610 but rebuilt in 1929. Kyoto is the birthplace of kabuki, and there is no better place in the world to see Kabuki as a first timer or experienced veteran. Kabuki is much like European opera but with a Japanese twist which includes more drama, more colours and much more spectacle! 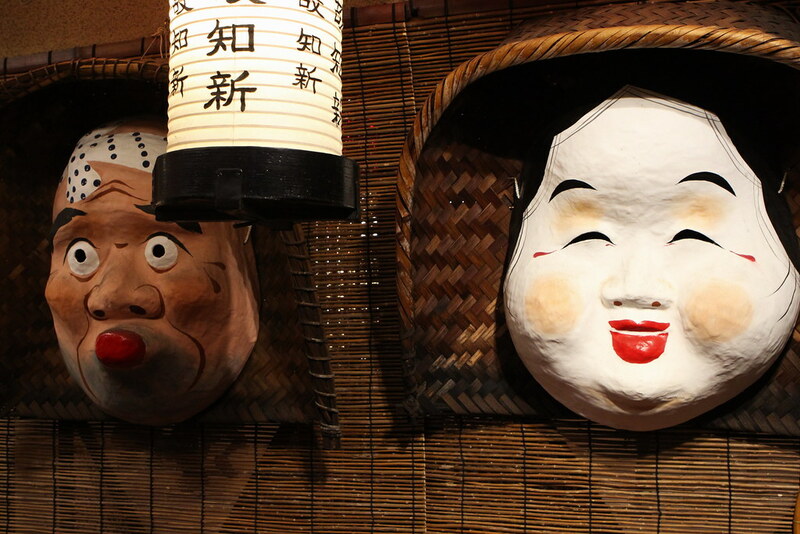 After learning more about Kabuki, we headed off towards Hanamikoji . Hanamikoji is the most historic of all the streets in Gion. 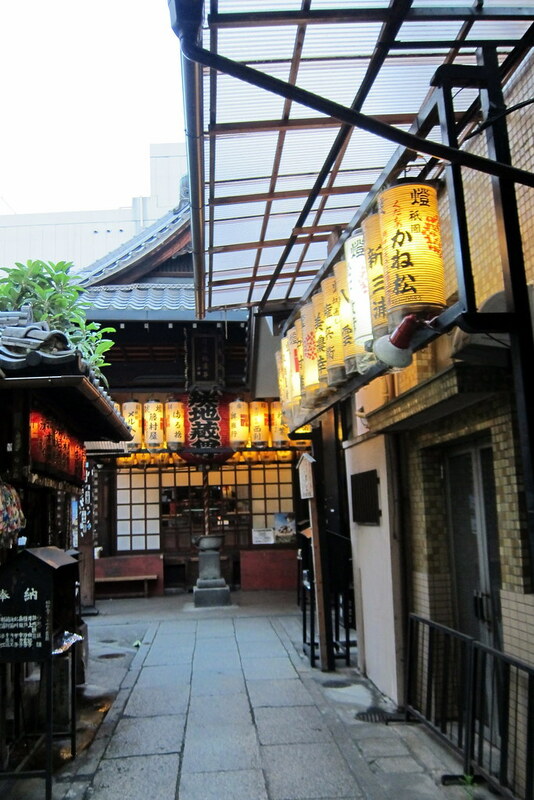 Many of the houses along the street are original wooden "machiya" merchant houses. 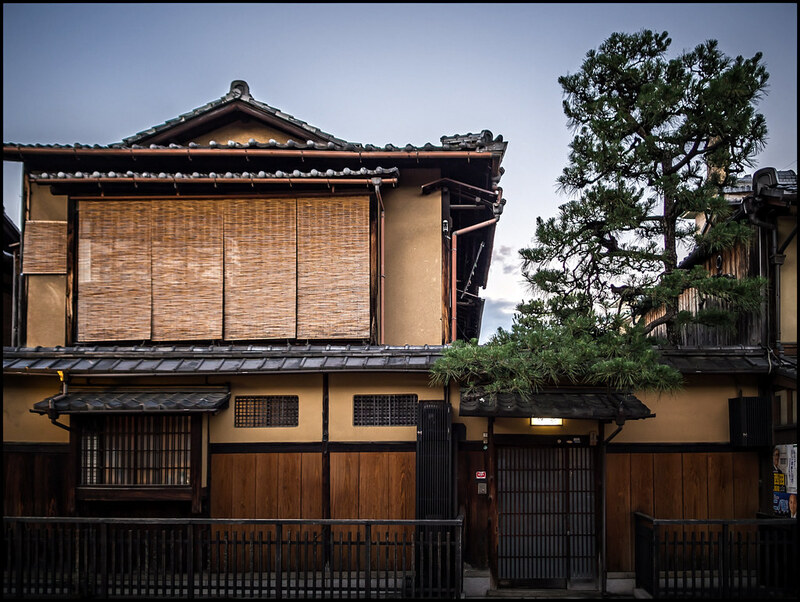 These beautifully preserved townhouses represent the architectural style of ancient Imperial Kyoto. These machiyas have been here for centuries and once would have served samurais. These days not all the shops on the street cater to knights of the empire. 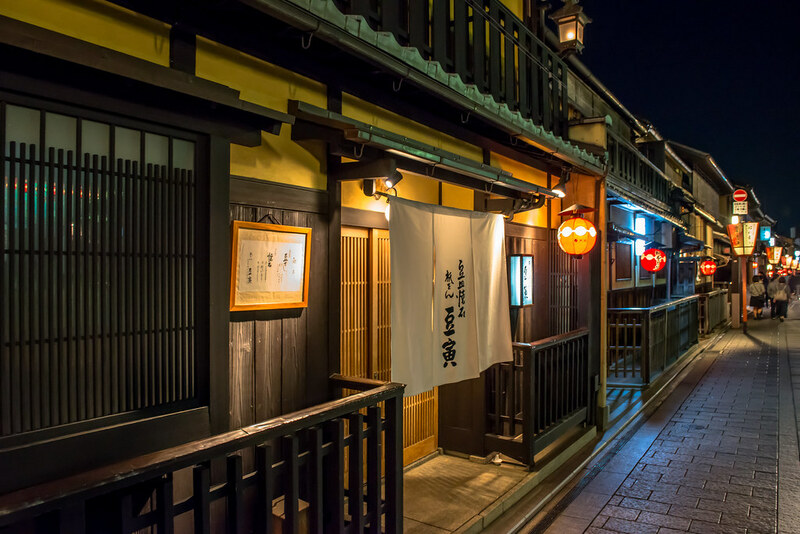 You can find some well priced, nostalgic restaurants and dessert shops where you can dine along one of Kyoto's well-known laneways. Buildings are trimmed in red, bamboo blinds hangs from second-floor windows, and high-class tea shops have elegantly dressed bouncers at the door, waiting to secretly usher in the elite Geishas coming to attend tea ceremonies. For those wondering how you can experience an evening with a Geiko, there aren't many options. Most Geikos are extremely expensive, and that's even if you can manage to get the contacts to book a dinner with them. They don't just have a phone line or website where you can make a reservation. You need to know someone who can give you a reference to get you in. Some tourist services offer evening dinners with "geishas", but often these aren't the real thing. Remember, if it's the real thing, it will cost a pretty penny, if you feel like it's too good to be true - it is. The red lanterns hang outside humble townhouses to indicate these are "ochayas" or teahouses, where Geishas are in attendance. Inside, guests will enjoy an evening of entertainment and fine dining by the Geikos and their house mother. They will sing and dance for their guests while food is served. Geikos delight in playing traditional Japanese drinking games with the finest sake with the business men. One of the most famous of these tea shops is the red-walled house called Ichiriki Chaya . Ichiriki Chaya is over 300 years old and is accessible by invitation only. It has been the scene of many samurai plots and where important governmental figures met and discussed the future of their great city. Although you might not be able to get inside, seeing this memorable building even from the outside is a treat. On the other side of Shijo Dori is the Shirakawa Canal and Shimbashi-dori . The Shirakawa Canal is one of the most picturesque parts of Gion. On either side of the canal, you'll find willow trees whose leaves hang over the water and onto the street, creating a green canopy. This street is much quieter than the Shirakawa area and is a great place to wander, away from the hustle and bustle of the main street. It was along this street that our guide pointed out to us the tiny little sign above a modest house which identified it as a Geisha/Maiko rooming house. To become a real Geiko or Geisha, you need to go through years and years of rigorous training. Most girls start training at the age of 15 and attend Geisha schools where they learn all the different skills they require to entertain their guests. Since they are not making any money at this point, their schooling, training and clothing are all provided and paid for by their house mother, the "okasan". After they become a full-fledged Geiko, they must pay off their debts to the house mother who will get them their jobs and find them, clients. Many girls dream of becoming Geikos despite it being a rather ancient occupation. Geikos are now becoming famous on the internet and girls dream of becoming insta-famous too. Just like girls in North America look up to celebrities, girls in Japan look up to these beautiful professional party girls. Beside the boarding houses along the canals, if you keep your eyes peeled, you'll find the Tatsumi Daimyojin Shrine . This tiny, neighbourhood shrine, almost completely obscured in darkness at night, is frequented a lot by many local Geishas. Beside the shine is a stone inscribed with a poem by the famous poet Isamu Yoshii . It was made to honour the artists since he had a great love for Gion. The poem reads: No matter what is said it is Gion I love. Even when I sleep beneath my pillow the water flows… On our way back over to Hanamikoji we stopped outside one of the various Maiko Schools. These are also hidden and aren't easily identifiable unless you know what you're looking for. Outside the building, you'll see a green board with a chart covered in white Kanji letters. This is their agenda for the day. Maikos will stop here throughout the day to see what and where their classes are. We also managed to find a few retro-styled, hairdressers where the Maikos and Geikos come to get their iconic hairdos. 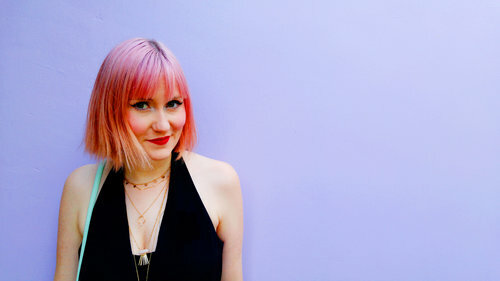 It takes an enormous amount of time and money to style their hair, and as such, they need to sleep with their head inside a box so as to not mess up their hair throughout the night. In the picture below you can see our guide trying to explain the process to our group. You can see how HUGE the group was here and how you had to fight to get to the front to hear anything. We finished our tour at Gion Corner . If you aren't in the know, don't have the connections or don't have a tonne of money to spend but are interested in seeing what happens inside a Geisha tea ceremony, this theatre puts on performances every day where you can see examples of their talents. 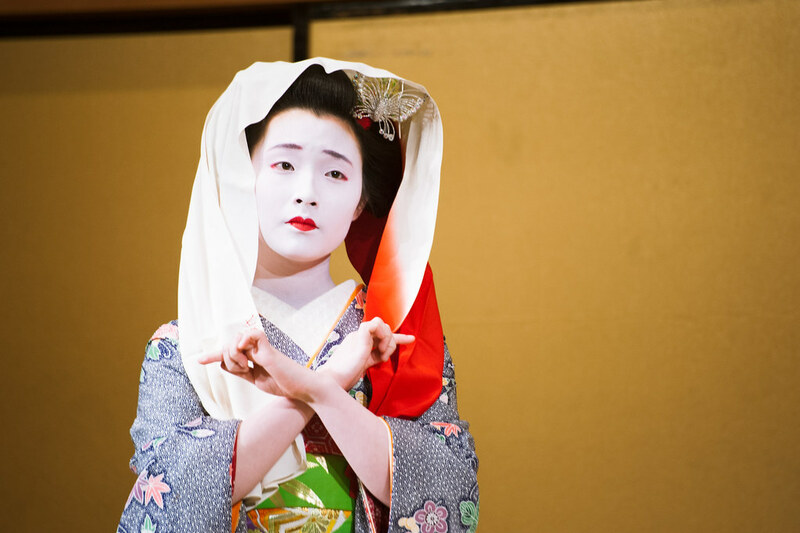 Maikos perform to show off their ikebana (flower arranging skills), perform bunraku (Japanese puppet theatre), and even perform a traditional Geisha dance. After the tour was over, we spent a little more time exploring the various side streets on our own. Although I LOVE guided tours and had the BEST time on our tour in the afternoon, these huge group tours feel a bit impersonal and not worth the money or time. I think with this guide and a little bit of research before you head out, you can explore Gion on your own, at your own pace and venture off from the giant tour groups. You might be surprised what you find around the next corner.